Shizuma Shigematsu, his wife Shigeko and their niece Yasuko all survived the Monday, August 6, 1945 attack on Hiroshima, experiencing the event from the perspective of varying distances from the epicenter. Shizuma was nearest the explosion and Yasuko sufficiently far away to suffer none of the immediate effects like translational injury, thermal burns or prompt radiation injury from the explosion itself. While husband and wife suffered from radiation illness in the years since, Yasuko herself appears to have escaped unharmed. More than four years later, survivors of the destruction of Hiroshima are the focus of prejudice and disapproval from those fortunate enough not to have lived through an atomic attack. Yasuko’s chance at a very advantageous marriage to a well-born young man is threatened when Yasuko becomes the subject or scurrilous rumours that thanks to her return to Hiroshima in time to be inundated by the black rain that followed the explosion, Yasuko did not escape unscathed. Shizumi’s unsolicited efforts to ensure the go-between that Yasuko (and any off-spring she might some day have) were entirely untouched by the atom only draws the go-between’s attention to this issue. Shizumi’s next gambit involves using Yasuko’s diary from August 1945 in his niece’s support. This evolves into a grander project involving the accounts of many survivors of the explosion. 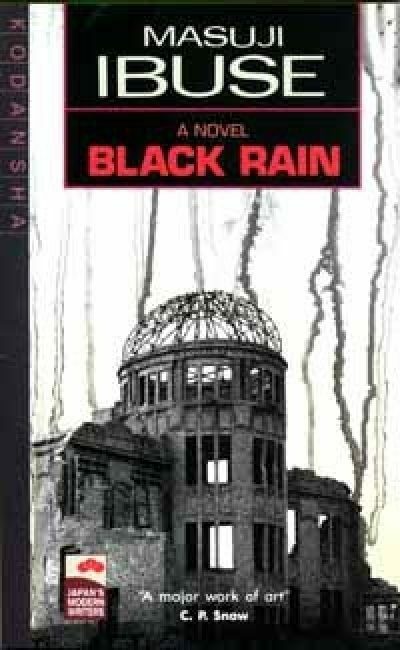 The resulting narrative does not really serve to assure anyone that Yasuko was unharmed by her exposure to the black rain but it does paint a harrowing account of the immediate aftermath and the weeks that followed. Unfortunately for Yasuko, her uncle is kidding himself. Perhaps youth protected her from the effects of exposure for a time but it becomes increasingly undeniable that she is suffering from some increasingly serious consequence from her visit to Hiroshima soon after the explosion. Her chance to marry her young man – perhaps any young man - is almost certainly doomed, and that may be the least of her problems. Masuji Ibuse (February 1898 – 10 July 1993) was born in Hiroshima in 1898 and while he was not in Hiroshima on Monday, August 6, 1945 he was familiar with the city as it was before the atomic bombing. In this 1966 novel, Ibuse draws on the accounts of people who were present during and after the nuclear strike on Hiroshima. Stupid thoughts first: it seemed to me that many of the survivors survived because of wildly unlikely moments of good luck, often involving having some sufficiently opaque object between them and the explosion. Then I realized of course they did because Shizumi can only talk to people who actually lived through the destruction of Hiroshima. Anyone in Hiroshima who wasn’t fortunate was vapourized, or killed by debris, or mortally injured by prompt heat and radiation or was consumed in the firestorm or succumbed to radiation injury in the weeks and months after. Even to live long enough be mortally ill four years later required a certain amount of luck. I think it would take a very hard-hearted person not to watch poor Shizumi’s frenzied efforts on behalf of his niece and not be overcome by the urge to shout “STOP HELPING” at him. To bang a familiar drum, I could not help but notice that even given the sometimes deplorable treatment of the survivors of Hiroshima by those who were not in the city when it was destroyed, what we see in both the immediate and long term aftermath is on the whole far more positive than one would expect if one’s expectations were based entirely on various science fiction and adventure novels and films. Some people do steal food and the official reaction is slow and disorganized  but there is nothing like the rapid descent of into the war of all against all fiction and various alarmists assure us would most surely be the case following a disaster of this magnitude. Many of the people who die in the aftermath die venturing into the city on ill-fated rescue missions and while lack of resources sabotages efforts to help those who escape the city, efforts to help them are made. The dead are accorded as traditional funerals as is possible under the circumstances. I would say somewhat scathing things about the effort by the Japanese government to misinform its people – everyone expects that should they win, the Americans will castrate all the Japanese men and the general comprehension of just how screwed Japan was by August 5, 1945 is lacking – but as it happens I also read accounts of the destruction of Hiroshima from the US point of view and a full and frank discussion of the facts was not on anyone’s agenda. Although the events shown are often horrific, Ibuse’s understated prose, as conveyed by translator John Bester, seems almost detached at times. Although the author doesn’t try to conceal the full extent of the consequences of the atomic bombing of Hiroshima, he does not revel salaciously in the pain and suffering of the people in Hiroshima. Bester’s introduction explains that different cultural values are at work and scenes that to a North American seem formal and cool would have a different connotation to someone who was Japanese; to my eye, the effect is more akin to reportage than fiction. Black Rain is available in English from Kodansha USA. Not helped by the profound aversion the central authorities had to coming to terms with their situation nor the fact many of the cities from which aid might have come had been previously destroyed through what we think of as conventional means but which at the time were pretty cutting edge.